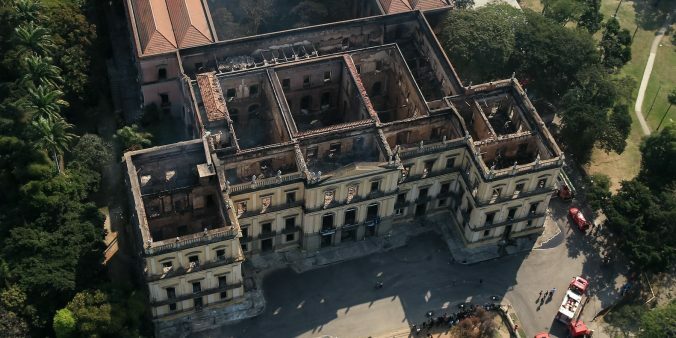 This week, tragedy struck the museum community and humankind with the burning of the Museo Nacional in Rio de Janeiro, Brazil. The 200 hundred year old museum, housed in the what was once the royal palace, has lost more than 90% of it’s 20 million object collection. While reports have come in that some objects such as Luzia, the oldest human fossil found in the Americas may have survived the devastation, those lost to the flames are among priceless objects and specimen that represent an enormous loss for not just the Brazilian people but human cultural heritage as a whole. Among those lost are nearly all of the 5 million specimen in the insect collection, roughly 700 Egyptian artifacts, a fresco from Pompeii, a large number of holotype specimen, dinosaur fossils, a Royal Hawaiian feather cloak, pre-contact artifacts, and recordings of now extinct indigenous languages. The loss is monumental and irreplaceable. However, this is not the first time, nor will it be the last, that a loss of this magnitude will affect our natural and cultural history. Akin, to the burning of the library in Alexandria, a symbol for the loss of cultural knowledge, this fire was the result of decreasing museum budgets, neglect, and a declining care for our natural and cultural histories. Last year the museum received an operating budget of just $13,000 for South America’s largest natural history museum. Staff and curators were reduced to online crowdsourcing campaigns to raise the money necessary to provide the most basic care and when firefighters arrived on the scene to fight the flames they found that both hydrants in front of the museum were dry. While neglect and lack of funding was at issue for the Museo Nacional in Rio, even museums with large operating budgets, strong disaster preparedness, and Emergency Response Plans can be at risk. This past year the Getty Museum in Los Angeles faced risk as the Skirball fire moved closer and closer, and many museums have been damaged by hurricanes and other natural disasters in recent years. No amount of emergency planning can fully protect a collection and with hurricane season back upon us it is important for museums to look for other ways to prepare for the worst. For myself, this issue shows the importance of digitizing collections. If the Brazilian Museum’s indigenous language recordings had been digitized and stored off site or in a cloud they would not be lost today. While a digital sample does not replace the actual object or specimen it is highly preferable to have at least a digital record than none at all. The day after the fire Wikipedia began a crowdsourcing campaign to collect images of objects in the museum from museum visitors to help investigators and curators piece together what has been lost and to attempt to keep the museums 20 million specimen collection in memory. Unfortunately, we may never know just what has been lost to the flames.